Today, he continues to paste his work in any city that doesn’t enforce their vandalism laws through caning. Also he made us promise to include the fact that he can hold his breath for over an hour, and that if anyone challenged him to a breath holding contest, they would totally lose,” but he was probably lying about that. 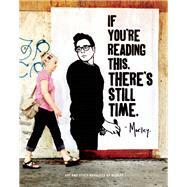 Morley is a Los Angeles-based street artist that specializes in bold, typographic posters which he wheat pastes within the urban landscape. He can hold his breath for over an hour.